Star Trek Comic Strips (UK) refer to a series of weekly comic strips based on Star Trek released in the United Kingdom from 1969-1973, with two additional stories that appeared in 1978 and 1979 respectively. The entire run comprised 638 pages. Published concurrent with the US Gold Key comics, these stories appeared in the pages of Joe 90: Top Secret, TV21 and Valiant. 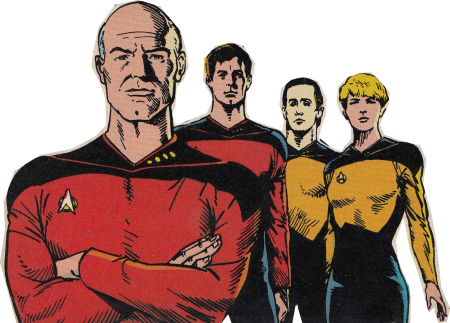 Strips appeared as two- and three-page spreads in magazines printing Star Trek and other adventure-based titles. 257 issues were published over the course of five years, with additional stories running in one Joe 90 annual, three TV21 annuals, a Valiant Super Special, two TV Comic annuals and an issue of Radio Times magazine. These strips are all available for free downloading online. The comics were loosely based on the USS Enterprise during James T. Kirk’s first five-year mission. There are several appearances of Dave Bailey, which may place some stories at the beginning of the mission, while others have appearances by Pavel Chekov, placing them toward the latter portion of the mission. Hikaru Sulu is often seen in a blue uniform, but this may be a coloring error; Kirk often wears a red uniform, and Scotty a blue one. Guest appearances and cameos included Andorians, Klingons, and Romulans. Aliens were often anthropomorphic animals, including birds, cats, gorillas, fish, and insects.